I’ve recently started using Pinterest as a quick and effective way to share with my followers there links to websites, videos, images etc that I have found interesting and helpful. It’s much faster to add a pin to one of my boards than it is for me to write a blog post or post the link on my Facebook page. And one of the nice things about it is you do not have to be a member to use it. But I believe you have to be a member to follow someone, but it’s easy and free to join. Pinterest is relatively new but is growing very rapidly. It’s basically a very visually oriented search site and the links are images generally from the pinned website. I basically just started using it. I have set up five boards so far, as you can see from the figure below. I even have a board that links back to content from my own website. However, most of my boards and their links go to web pages that I have found very helpful. It’s kind of visual version of my Favorites or Bookmarks. I’m still learning the subtle ways to use Pinterest. For example I do not know exactly what re-pinning is all about. 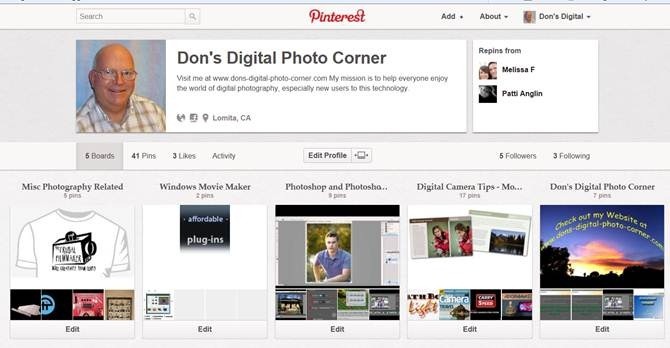 To check out my Pinterest site, go to www.pinterest.com/don26812. You’ll find I have pinned this blog post there. Let me know what you think, ok. I have my schedule for the digital photography classes I’ll be teaching this fall. Actually, I will also be teaching a basic iPad class for PV NET this September. Although it is not strictly a digital photography class, we will look at some of camera and editing apps in the course. I will again be teaching a basic Photoshop class for Torrance. This time around, I will be covering additional topics on processing camera RAW images using the Adobe Camera RAW (ACR) editor. We will again be using CS5. The camera classes at both Torrance and the South Bay Adult School will return to their original format of one class dedicated to the compact or simpler cameras and the other class focusing on using digital SLRs or the more advanced cameras. I will be teaching an Advanced Photo Editing class at both the South Bay Adult School and Torrance. This term I am also broadening the photo organizing class I will be teach at Torrance to include other topics that someone just beginning to get into digital photography needs to know. Ok, here are the links to the schedule and class descriptions for the classes I will be teaching come September. The term for all of the schools begins on September 10th. On-line registration and sign-ups for the fall term should be available very soon. If you do not want to copy/paste the link, you can just go to my web site www.donstouder.com and follow the applicable links from there. You can now follow me on Facebook. You can click the link below or go to the Facebook button in the upper right corner of my blog page. And while you are there, please LIKE me. Thanks a lot. Finally, I have discovered Pinterest, which is a clever way to provide visual links to just about anything on the web. I’m using it to spread the word about web sites, tutorials, and videos that I have found valuable, as well as those I have created myself. I’ve started a Board on camera tips, Photoshop, and one linking to tutorials etc from my web site. I’m just getting started and learning about Pinterest, but I will be posting more and more links here as time goes by. Check it out. Well that about does it. Enjoy the summer. I hope to see you in a class this fall. Please follow me on Facebook, my blog, and check me out on Pinterest. And thank so much for all of the support you shown me over the years. I titled this short post epilog, because I started this series with a prolog. Basically, I completed the recovery process from having my “important business” computer crash and burn. As a quick review, not only did I need to buy a new computer to replace it, but I took the opportunity to have the new PC be devoted to my photo/video editing activities at the same time. I converted my now older, which was for my photo/video work to handle less demanding tasks. I did not lose any data, but it has just taken time to move everything around and install the programs I need on the new computer. I still have some housekeeping to do and some additional programs to install. This will continue for a while, but basically I am up and running normally, splitting my activities between the two computers as I had been doing prior to the crash. Now it’s on to bigger and better things. I believe I have moved/converted all of the Catalogs I need to for now. For those of you who may be wondering why I have multiple Catalogs, don’t worry. For the vast majority of PSE users, one Catalog is quite sufficient. My situation and need for multiple Catalogs is unique and may very well not be the best way for me to handle my large collection of photos, videos, and audio files. I have five prime Catalogs split between my two desktop computers, as well as a couple more on my laptop. Here are the five relevant Catalogs that I’ve had to Restore and/or move as part of my recovery task. All of these now reside on my new PC I call PC3700. For clarity (mine) I will use their actually names. Most of you have one Catalog and it is named My Catalog, which is great. Video Tutorials 1 – My video tutorials and those I’ve downloaded. Keeping all of these straight as I’m converting, and moving their large number of files and folders from one PC to another or from a back-up external drive is proving to be quite a challenge. On last bit of news to report. So far it has been no problem to install my Office 2010 Home Student edition on my new PC. I did call Microsoft Customer Service, but I don’t think they did much at their end. No nasty messages regarding too many installs, and I appear to be caught up on the latest security patches. Hopefully that will continue. This whole process is taking time, because I need to do other things also. Right now my biggest problem is with Outlook email, which is only partially related to my computer crash. Thanks for reading, and don’t hesitate to leave a comment.